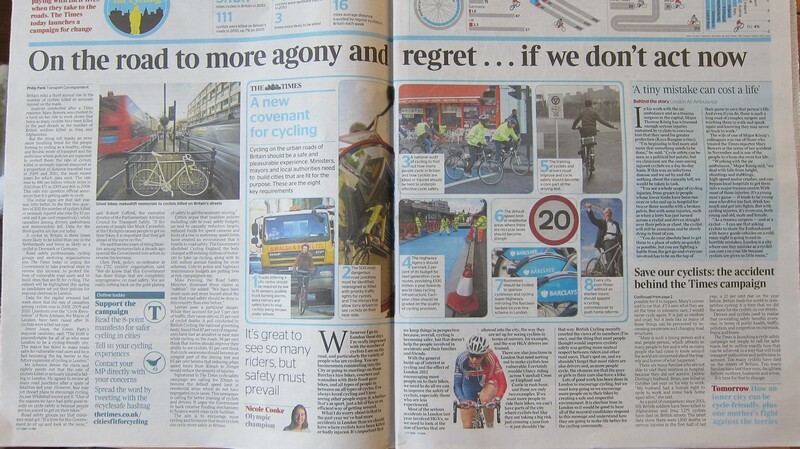 It’s great to see cycle safety on the front page of a national newspaper. The Times is thundering away about the need for urban cycle safety following the serious injury of one of its young reporters who remains in a coma. 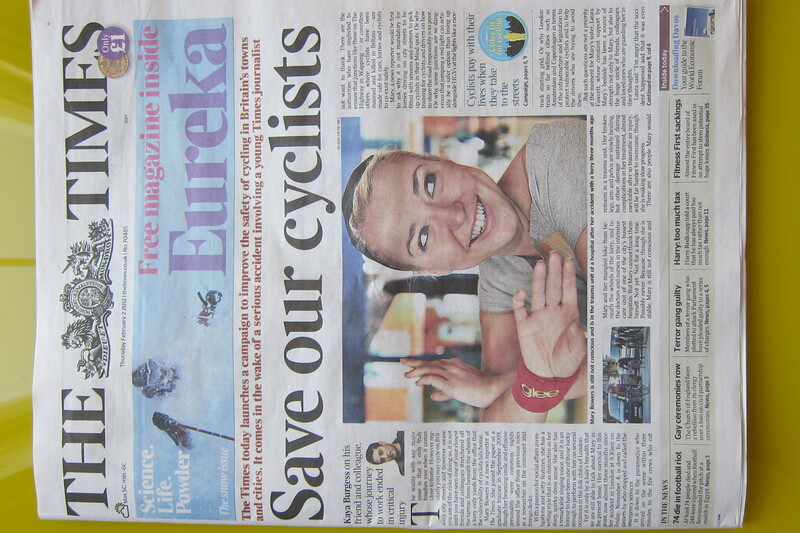 Kaya Burgess at the paper has been championing cycle safety for a while and it’s great to see him hit the front page. The campaign is a great start, but I wonder if it isn’t a little naive in exhorting reviews and new bureaucrats such as cycle commissioners. Years of hard nosed campaigning leads me to think that this sort of thing will achieve little. In London the Mayor will announce a review of whatever he feels like that will report conveniently far after the Mayoral elections. One or two high profile junctions will be fiddled with but the systemic problems of the Mayors traffic flow policy will continue. The people who work in and run our major civic bureaucracies know what needs to be done to make cyclists safer at persistently dangerous junctions. They just make the chilling choice not to do it. They put cars and ‘traffic flow’ first. To my mind campaigners now have to take the courts to hold our politicians and bureaucracies to account. This is why we have driven so hard here on holding TfL to account for corporate manslaughter over the Deep Lee death in Kings Cross. Prosecutions though mean the police upping their game to initiate prosecutions of people in councils that they work with day to day to manage safe roads. In London the Mayor is in charge of the police and TfL, which makes things very complex indeed.